What to Do with Montana's Oil Wealth? Montana is one of a number of U.S. states that has a sovereign wealth fund. Some of these funds were originally created in the 1800’s through Congressional action (the land trust funds), but several of them, including the Alaska Permanent Fund, are of more recent vintage. In fact, these newer funds owe their existence to the State of Montana, which was the first state to successfully defend a severance tax on mineral production. The Supreme Court case, Commonwealth Edison Co. v. Montana, 453 U.S. 609 (1981), held that Montana’s severance tax did not violate the Commerce Clause of the U.S. Constitution. Other mineral-rich states, following Montana’s lead, established severance taxes on mineral extraction, and many of them created permanent funds to safeguard some of this wealth for future generations. The most impressive recently-created state SWF is North Dakota’s Legacy Fund, at least in terms of how quickly the fund has grown. North Dakota’s oil wealth comes from the Bakken Formation, which holds several billion barrels of extractable oil. The Bakken Formation extends into Montana, and as oil production wanes in North Dakota and waxes in Montana, what will Montana do with its oil wealth? 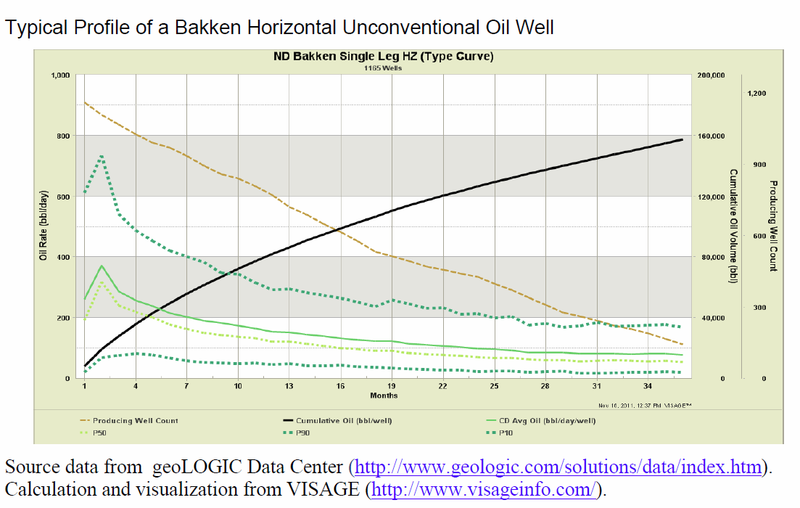 Based on these data, [in its second year] the typical Bakken well will produce only 55 percent of what it produced in the first year, a 45 percent decline. The decline rate slows to 32 percent in the third year. After three years average daily production of 78 barrels is only 21 percent of the peak average daily production of 372 barrels achieved in the second month of production. Montana is sacrificing taxes from the best months of production (a fact I’m sure they recognize and have heretofore balanced against competing factors). My bet is that tax policy will change as Montana looks across the border and sees the success of the North Dakota Legacy Fund, and seriously contemplates how the state can maximize the value of its own extensive oil reserves. Some governments have been taking advantage of the ongoing instability in Libya to try to wrest control of assets bought by the fund. In Zambia, the President nationalised the LIA’s $257m stake in the local telephone company. In Niger, the parliament voted to nationalise its phone business, breaking promises to sell it to the LIA. In Italy, the financial police seized LIA-owned assets on the grounds that the LIA is a Gaddafi-controlled entity. These include stakes in UniCredit Bank, the oil giant ENI, Fiat, and even Juventus Football Club. The seized assets total some $1.39bn. As is now blindingly obvious, Western businesses should never have got involved with the LIA. Not only due to the distasteful nature of Gaddafi’s regime, but because the fund was so opaque. Details of its investments were sparse, financial accounts hard to access or impossible to interpret. The concept of “know your customer” must have been pretty much absent in all dealings with the fund. An investigation last year by Libya’s transition government found “misappropriation, misuse and misconduct of funds” . It said $2.9bn was missing. A subsequent Financial Times investigation found widespread mismanagement and waste, and even employees admitted to a shambles. The initial deal required that the merger and retention package be approved together. But in a clever move bound to have its shareholders’ heads spinning, Xstrata claims it has decoupled the two issues by separating the vote. Part I: Approve the merger and accept the compensation package. Shareholders can vote yes or no on the first question and also yes or no for both parts of the second question. Critically, Xstrata is letting shareholders vote yes to both parts of Question 2. This is important because if the first question (whether to approve the compensation package) is approved, then any votes made to approve the merger and reject the compensation package are disregarded and only votes to approve the merger and accept the compensation package are counted. If the first question is not approved, then any votes made to approve the merger and accept the compensation package are disregarded and only votes to approve the merger and reject the compensation package are counted. The problem is that if you want the merger to go through but don’t want the incentive package, you are faced with a quandary. If the retention package is approved and you vote no on the merger and retention package, your vote won’t count toward the 75 percent of shares needed to approve the merger. The result may be that a merger you want does not happen because the necessary vote cannot be achieved. Where Are Public Pensions Putting Their Money? In general, they are allocating a bit less to traditional assets (equities and fixed income) and more to hedge funds, private equity, and real estate funds. This seems to me another sign that pension funds are under significant pressure to increase their returns to match their upcoming (and often not fully funded) liabilities, and are chasing riskier investments as a result (see Ashby Monk’s views on this issue here). Are Huawei and ZTE State-Owned Enterprises? The House Intelligence Committee seems to think so. The designation of a company as a state-controlled enterprise has important effects under the rules governing the Committee on Foreign investment in the United States (CFIUS): deals resulting in control of US enterprises by foreign government-controlled entities will automatically be formally investigated by CFIUS. The Committee thus focused primarily on reviewing Huawei’s and ZTE’s ties to the Chinese state, including support by the Chinese government and state-owned banks, their connections to the Chinese Communist Party, and their work done on behalf of the Chinese military and intelligence services. Interestingly, the House Report often focuses on what it did not find, i.e., evidence that Huawei and ZTE were not connected in important ways to the government, the Chinese Communist Party, or the People’s Liberation Army. The United States Intelligence Community (IC) must remain vigilant and focused on this threat. The IC should actively seek to keep cleared private sector actors as informed of the threat as possible. The Committee on Foreign Investment in the United States (CFIUS) must block acquisitions, takeovers, or mergers involving Huawei and ZTE given the threat to U.S. national security interests. Legislative proposals seeking to expand CFIUS to include purchasing agreements should receive thorough consideration by relevant Congressional committees. U.S. government systems, particularly sensitive systems, should not include Huawei or ZTE equipment, including component parts. Similarly, government contractors – particularly those working on contracts for sensitive U.S. programs – should exclude ZTE or Huawei equipment in their systems. Recommendation 2: Private-sector entities in the United States are strongly encouraged to consider the long-term security risks associated with doing business with either ZTE or Huawei for equipment or services. U.S. network providers and systems developers are strongly encouraged to seek other vendors for their projects. Based on available classified and unclassified information, Huawei and ZTE cannot be trusted to be free of foreign state influence and thus pose a security threat to the United States and to our systems. The report also calls for greater transparency from Chinese firms, and this really is a necessity. The trouble for China is that the activities of just one or two SOEs taint investment activity by any of China’s state-controlled enterprises. If China Investment Corporation is concerned with the politicization of CFIUS process (and I agree that this is a serious concern), it can place some of the blame within China’s own borders; lack of SOE transparency may provide cover for protectionist responses just as it may generate real concerns with national security. In Western capitalist societies, state-owned enterprises (SOEs) are typically created for two reasons. The primary situation in which we see investment in existing enterprises or creation of new enterprises is when the government or economy is in crisis, such as in wartime or during a major economic crisis. Most of these “crisis investments” are unwound after the crisis has passed. In the U.S., examples of such investments include the wartime companies such as the War Finance Corp. and Defense Homes Corp., Depression-era companies (some of which still remain) such as the FDIC, Tennessee Valley Authority, Commodity Credit Corp., and the Financial Crisis investments in AIG, Citigroup, and GM. The second category of investment concerns the creation of enterprises that are designed to perform important societal functions, but lack private investment and/or would benefit from a more efficient and politically insulated form. SOEs may provide for more efficient production of important services because of economies of scale, efficient pricing, and higher levels of investment and innovation. U.S. SOEs created under this justification include the U.S. Postal Service; Amtrak; Space Communications Satellite Corp. Although not directly owned by the government, there are also private corporations that have been created or backed by governments and are deemed essential to regulation and may have implicit ongoing federal support (e.g., public-private partnerships, and Fannie/Freddie pre-conservatorship). An independent Chinese study has found that if all the government’s grants and hidden subsidies were taken away, the SOEs would lose money. They pay hardly any dividends back to the government. Instead much of the wealth has ended up enriching SOEs’ chiefs and political patrons. SOEs damage small and medium-sized Chinese enterprises, which are starved of money. This deprives China of the bamboo capitalists whose drive and innovation is needed more than ever now that economic growth is slowing. Not only do these concerns apply to SOEs, but they apply to all situations in which the government invests in or provides subsidies to private enterprise. Are you listening, JobsOhio? The President may take such action for such time as the President considers appropriate to suspend or prohibit any covered transaction that threatens to impair the national security of the United States. No one has ever before sued the US president over this type of ruling, but Ralls argues that Mr Obama exceeded his powers when he blocked the project and without giving a detailed justification. On Friday afternoon, Mr Obama issued an order compelling the company to sell within 90 days four wind farm sites in Oregon, and to clear all its equipment and structures off the sites within 14 days. He also asserted the right to interview Ralls’ employees and advisers and to inspect its documents and computer records in the US, to ensure that the order had been carried out in full. The statement said: “There is credible evidence that [Ralls] . . . might take action that threatens to impair the national security of the United States,” but gave no further details. Lawyers not involved in the case said Ralls would face an uphill battle to win its case against Mr Obama, with courts generally reluctant to challenge presidential decisions relating to national security. Stephen Mahinka of Morgan Lewis & Bockius in Washington said the case reflected the problems caused by the opacity of the Cfius process. “From the US point of view of attracting foreign direct investment, it is counterproductive to be so non-transparent,” he said. . . The actions of the President under paragraph (1) of subsection (d) and the findings of the President under paragraph (4) of subsection (d) shall not be subject to judicial review. That is not to say that the statute itself could not be declared unconstitutional, although it is not unusual for a federal statute to declare that executive action taken pursuant to the statute is non-reviewable (in immigration law, for instance). The order requires Ralls to divest of its interests in the windfarms within 90 days, and to remove “all items, structures, or other physical objects or installations of any kind (including concrete foundations) that the Companies or persons on behalf of the Companies have stockpiled, stored, deposited, installed, or affixed on the Properties” within 14 (!) days. Would the President have made this order in a non-election year, when the issue of whether he has “stood up to China” had not been repeatedly raised by Mitt Romney? I don’t have an answer to that, and the concern that I can’t say “yes” with certainty to that question is undoubtedly shared by many foreign investors.